My usage of these tools ranges from very simple to more complex. In the case of gimp, for example, I mostly do quick editting, crop, resize, fix colours, etc. I use audacity for quick audio recording and editing, like cutting a song in half or quickly record my mic. Ardour is such a powerfull DAW, which is more complex to use. I can use it because my background in the audio business (did you know I worked as recording/mixing/mastering engineer in a recording studio 10 years ago?). The last amazing feature I discovered in Ardour was the hability to do side-chain compression, great! 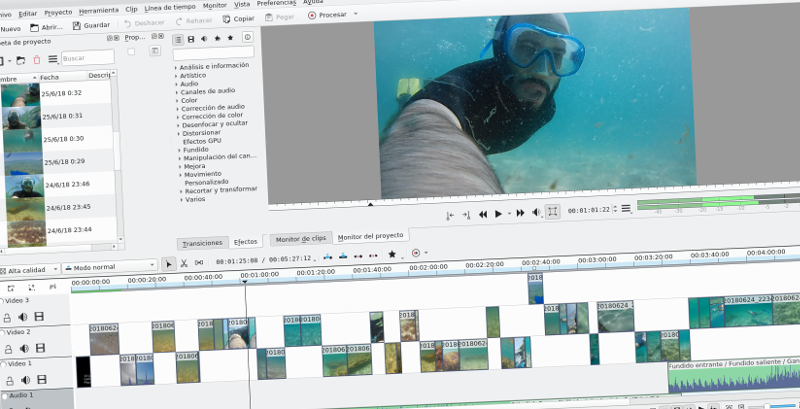 For video editing, I started using openshot some years ago, but I recently switched to kdenlive, which from my point of view is more robust and more fine-tunned. You should try both and decide which one fits your needs. And another awesome tool in my setup is handbrake, which allows to easily convert and transcode video between many formats, so you can reproduce your videos in different platforms. It amazes me how these FLOSS tools can be so usefull, powerful and easy to install/use. From here, I would like to send a big thanks you a lot! to all those upstream communities.